The biggest criticism of the New Road Angel was that it didn't know the speed limit for the camera it was warning you about - with the Road Angel Compact Blackspot have addressed this to produce an excellent GPS based "Safety Camera" warning device. The RoadAngel works by storing the locations of speed-cameras inside its memory, then compares that with its known locatuion from its integral Global Positioning Satellite reciever. As you approach a known camera location, accident blackspot or common mobile camera location, the unit gives you an audible and visual warning, making you slow down, and save your driving license! The Road-Angel compact is smaller (duh!) than the original, and sits rather nicely in its cradle hanging from the windscreen, taking its power from a lead to the cigar lighter. As with all products of this kind, new Speed Camera maps have to be downloaded from Blackspots website regularly. You get 6 months worth of updates free, then you have to pay a small monthly charge. In use, the Road Angel Compact that I was using performed flawlessly, picking up all the speed cameras in my town, and only warning me when I was approaching, near, or over the limit. A criticism of the device would be the lack of laser detector (which its big brother has), but one is available as an optional extra that plugs into the back of it. 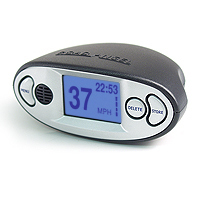 Overall the Road Angel compact impressed me with its accuracy, ease of use and price, but I do think that the Laser Detector is a must-have add-on, otherwise you might well as just download Speed Camera POIs to your GPS Navigation Device.